Temperatures will dip to below freezing. OUTBREAKS OF SNOW will return overnight as a yellow snow-ice warning remains in place until midday tomorrow. 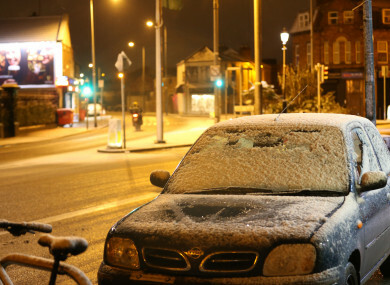 Met Éireann says that it will be cold and frosty overnight with showers, some heavy and thundery and with some hail, sleet and snow. These will be most frequent over the north-west, where further snow accumulations are likely. Tomorrow will continue cold with frost clearing. There will be some sunny spells with hail, sleet and snow over Ulster and Connacht. Temperatures will range from three to six degrees Celsius. Tomorrow night will be rainy and cold. The weekend will be milder in places, but still wet and windy. Monday will be a bright and breezy day with sunny spells and a few showers. Email “Yellow warning in place as snow set to return”. Feedback on “Yellow warning in place as snow set to return”.